Step-by-step process for basic lithography. The shapes drawn into a positive resist (left) layer are dissolved away, revealing grooves to be filled in with new material. With a negative resist (right), the drawn shapes actually remain, and the parts not exposed to light or to electrons dissolve away. Reproduced from Gui et al. with permission of The Royal Society of Chemistry. Much of what we encounter day-to-day happens at the surface. In simple actions like drying our hands with a towel or looking at a road sign, the surface is the first thing we touch or see. Not surprisingly, by just changing that surface, we can drastically alter an object's properties. Engineering coatings and surfaces has become a useful technique in energy research. Researchers in the Light-Material Interactions and Solid-State Solar Thermal Energy Conversion Energy Frontier Research Centers (EFRCs) are focused on controlling the absorption of sunlight. After light propagates from the sun and goes through the Earth’s atmosphere, the first thing it encounters is the top surface of an absorbing medium such as a solar cell. By fabricating intricate surface patterns, scientists at these centers have found they can considerably enhance absorption of sunlight and improve solar energy technologies. These surface patterns require very small features (100 to 10,000 times smaller than the width of a human hair), but to be relevant for real-world applications, these patterns must also span surfaces many square inches in size. A standard technique to make such small-scale surface patterns over a large area is called lithography. When camera film is exposed to light while a picture is taken, the film actually captures the negative of the image ultimately desired. A resist in lithography is often the same way, where the shape drawn in the resist layer is actually the negative of the end surface pattern. After drawing the negative pattern and dissolving it away, the resulting grooves are filled in by depositing a new layer of material over the entire surface. 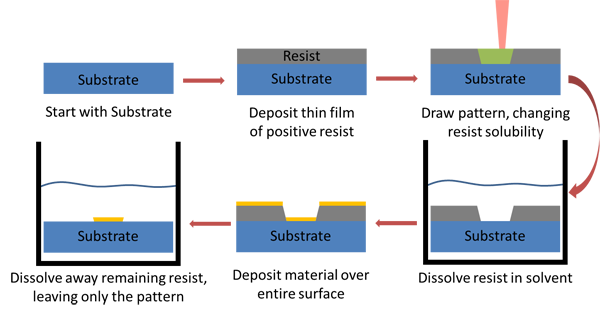 The remaining resist is then dissolved in a final chemical etching process with a different solvent, leaving behind only the desired surface pattern. Technically, this sort of resist—which changes its solubility to dissolve in a solvent—is called a "positive" resist. There is in fact another kind of resist called a "negative" resist, which works in just the opposite manner. With positive resists, one draws the pattern that dissolves away, and with negative resists, one draws the pattern that remains. With these lithography techniques, Soo Jin Kim and his colleagues from the Light-Material Interactions Energy Frontier Research Center (LMI) fabricated beams of germanium as small as 32 nanometers across on top of a substrate. Germanium is well suited for absorbing sunlight, but it is rare and expensive. By using two sets of beams, 32 nanometers and 120 nanometers in size, they enhanced light absorption across much of the solar spectrum, while requiring very little material. These methods to improve solar absorption can significantly reduce the material cost of solar cells. The surface patterning approach described above can be repeated to create features that are quite complex. The basic idea is to continually deposit, pattern, and then dissolve layers of material to achieve an end goal. A more complicated fabrication procedure is outlined in the work by Jeffrey Chou from the Solid-State Solar Thermal Energy Conversion EFRC (S3TEC). Instead of designing a solar cell that converts sunlight into electricity, Chou and his colleagues designed a solar thermal absorber to convert sunlight into heat. As this kind of absorber gets quite hot, the materials need to withstand high temperatures. Standard solar cells use semiconductors as their primary absorbers, like germanium. However, semiconductors are generally not well suited for high-temperature applications. To overcome this hurdle, Chou used stable materials that can tolerate high heat such as metals and ceramics and then formed a two-dimensional surface pattern to enhance solar absorption. As a result, they developed a highly efficient solar thermal absorber that is stable even at 1,000°C and that can still be fabricated on a large scale. Fabrication process for solar thermal absorber. Image courtesy Chou et al. The first steps in lithography are to deposit a layer of resist and carve a pattern into it. The result is effectively a stencil to use for further deposition of other materials. There are other stencils that don’t require use of a resist, such as anodic aluminum oxide templates. These templates actually self-assemble under the right conditions to look just like honeycomb structures with holes only a few hundred nanometers in diameter. As material is deposited on the template, it fills these holes and forms pillars. Zhe Gui and her colleagues from the EFRC Nanostructures for Electrical Energy Storage (NEES) use these anodic aluminum oxide templates to form nanowires of mixtures of ruthenium oxide, RuO2, and manganese oxide, MnO2, that exhibit especially high capacitance. Capacitance is a measure of the amount of electrical charge a material can contain (think charge capacity). Materials with high capacitance potentially offer means for storing charge with higher power output than standard batteries. Capacitance scales with total surface area, and the nanowire surface pattern that Gui fabricated offers a large surface area in a compact volume. However, it also offers an additional benefit. By virtue of the nanowire patterning technique, Gui successfully mixed a small amount of RuO2 uniformly throughout the predominately MnO2 nanowire. Traditionally, MnO2 is not great at storing charge, whereas RuO2 is. It is expected that adding some RuO2 will naturally increase the capacitance of the nanowire. However, the uniformly mixed RuO2 actually causes the capacitance of each nanowire to increase by more than just the intrinsic capacitance of the added RuO2. 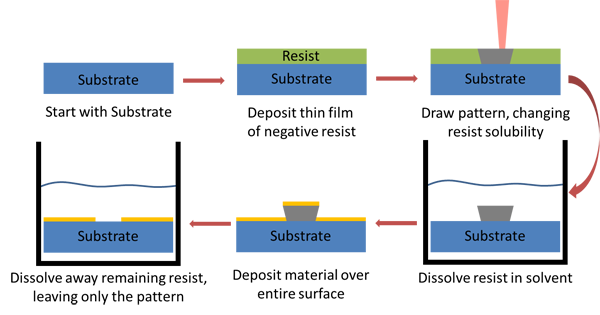 In other words, RuO2 and MnO2 behave together such that the total capacitance of the nanowire array is more than just the sum of its parts. Growth of nanowires with anodized aluminum oxide template. Reproduced from Gui et al. with permission from the PCCP Owner Societies. Many patterns in many applications. Researchers in EFRCs have found ways to use nanoscale surface patterning to achieve high performance in widely different disciplines. This is certainly a testament to the researchers' creativity and to the versatility of their fabrication techniques, but it is also a feature of surfaces in general. Whether the goal is to transfer charge into a nanowire or to transmit light into an absorbing medium, something always encounters a surface first. As the need for new energy technologies continues to grow, so too will our use of these nanometer-scale surface patterns. Chou et al. This work is supported as part of the Solid-State Solar Thermal Energy Conversion (S3TEC) Center, an EFRC funded by the U.S. Department of Energy (DOE), Office of Science, Office of Basic Energy Sciences. Gui et al. The work was supported by the Nanostructures for Electrical Energy Storage (NEES), an EFRC funded by the DOE, Office of Science, Office of Basic Energy Sciences. We thank Maryland Nanocenter, the Nanoscale Imaging Spectroscopy and Properties (NISP) Laboratory. Kim et al. This work is part of the Light-Material Interactions in Energy Conversion EFRC funded by the DOE, Office of Science, Office of Basic Energy Sciences. Nate Thomas is Ph.D. candidate in Materials Science at the California Institute of Technology and is a member of the Light-Materials Interactions Energy Frontier Research Center. He works for Austin Minnich, designing and fabricating photonic structures for the selective absorption of solar thermal radiation. He holds a B.A. in Physics from Amherst College.